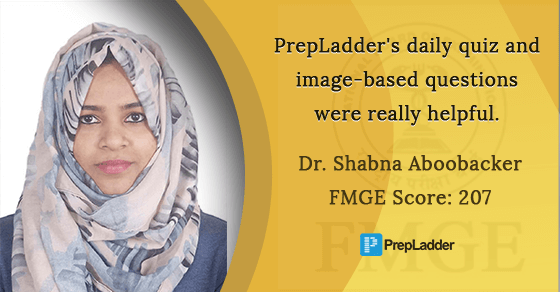 PrepLadder congratulates Dr. Shabna Aboobacker on clearing FMGE June 2018 exam. We wish her all the very best for her career and future ahead. My name is Dr. Shabna Aboobacker. I'm a student of Wuhan University China. I participated in 2 FMGE Mocks by Dr. Deepak Marwah and scored 153 and 168 marks. This encouraged me to work harder and I finally scored 207 marks in FMGE June 2018. Both MCQ + Theory should be given equal importance. The ideal time to start the preparation is the first year. Honestly, I didn't refer any books except Dr. Aman Setiya Sir's Pathology Book. Till my 5th year, I studied mainly the ppts given by my university professors and some videos of Dr.Najeeb. I seriously started preparing for FMGE in my 5th year and joined 2 months AFMG coaching during my 5th-year vacation in Feb and March 2018 where I got coaching for 11 subjects which helped me a lot. Remaining subjects I mainly focused on FMGE Solutions. I had revised this book thrice. I also attended PrepLadder Mock tests which I found very useful during my preparation. Yes. I had a study plan but I failed to follow it many times but I was so determined that I didn't give up sticking to it. Easy-Micro, Biochem, Physio, ENT, Ophthal, Forensic. One should not lose hope. As I mentioned before practice, revision, determination, and persistence have helped me achieve this. Please don't give up and never lose hope. We thank Dr. Shabna Aboobacker for sharing her success story.